For part one of this story you will need to read here. Dogs do not generally get a great press in the bible. Why is that? Why are they seen as the lowest of the low, when one of my greatest companions, my most faithful followers, my friend even when I am feeling demonic, is my dog? Could those far-off people not see that dogs were special? That all they needed was someone to take them off the streets and give them a nice perfumed bath and quick flea treatment. to render them the perfect sidekick? Look up bible verses with dogs in, and you won’t find comfortable reading. Some of it is stomach-turning. But there is one book in which a dog plays a pivotal part, and I never knew. It is the book of Tobit. Given, it is only a book in the Catholic and Orthodox traditions, and even they never even decided it was part of the bible until 397AD at the Council of Carthage. But in it there is a story of the firm relationship between a man and a dog; of the dog who follows his master into uncharted territory, and sleeps on the bed even when demons are imminent. As owner of Macaulay the Dog, I know this to be entirely credible. For a small terrier will meet danger – even the most metaphysical kind – and its hackles will rise and it will stand its ground, barking fit to wake the dead. So Tobit is an old pious man, a hero in exile who has stayed faithful to God but is struck blind. His son sets out to recover a loan his father once gave in far-off Media, and who does he take with him? His dog, of course. On the way, in that deliciously random fashion those old bible stories have of throwing in the bizarre, Tobias is attacked by a large fish whilst bathing: illogically but ambitiously, the fish is caught in the act of trying to swallow Tobias’s foot. How it thinks it will conquer the rest of him I don’t know, but the fish never gets the chance to find out. Whatever damage the fish has done to itself by trying to swallow a substantial human foot is compounded by Tobias, who captures it, and removes the heart and the gall bladder for the making of medicines. When he reaches Media he meets poor Sarah: a beautiful young woman who has an unfortunate relationship with a demon. He is the demon of lust, Asmodeus, and he’s persistent: Sarah has been married seven times, and each time Asmodeus has dispatched the newlywed husband to the afterlife on the very day Sarah and her hopeful are married. Tobias is most taken by Sarah, and as luck would have it he has what none of the other husbands had to help him wage war on Asmodeus: an angel, Raphael. Raphael knows that Asmodeus is a bit of a stickler for smells. For a demon of lust, he has quite a sensitive nose. This is what you do, the angel tells Tobias: remember that heart and gall bladder? Burn it in the corner of your wedding chamber. The dog, being a terrier, appreciates the new musk. The little hairy companion was made for smells like that. But the demon? He takes one draft and scarpers, all the way to Upper Egypt. And Tobias is saved: and he and Sarah get the rest of their wedding night all to themselves. Apart, that is, from the dog on the bed. Posted in Folk tales, Macaulay The Dog stories, Quirks of HistoryTagged bed, Book of Tobit, dogs, Tobias, Tobias and SarahBookmark the permalink. Had never heard that story before. Good stuff. Similar in a way, but cats. I haven’t, Michael, thank you! I’ll take a look! There is nothing like a first night with a dog on the bed! I envy your having Mac. My Annie is a 60-lb retriever mix and she retreats if I even open the freezer door (she’s learned that loud noises, like the banging of frozen foods on the counter, are likely to follow). That’s a lot of retriever, PT 🙂 They have beautiful temperaments, though: I bet Annie is a wonderful companion. Told, dear Kate, as only you can tell a tale. I love reading these little tidbits that never made it into the general bible, Kate. What a story. Has all the weirdness of the mediaeval, Andra. You’re right, now that you point it out, dogs are few and far between in the Bible. I’m glad you found and shared this delightful story for us. Terriers RULE!! They do, Silver. Faithful companions, all. I think my son would have paid much more attention in church (and been less a problem) had this story been told! What a wonder it is. I don’t know where you find these gems, Kate. So entertaining! This lead came from the V&A, Debra; like you, I just look around and the stories come to meet me. 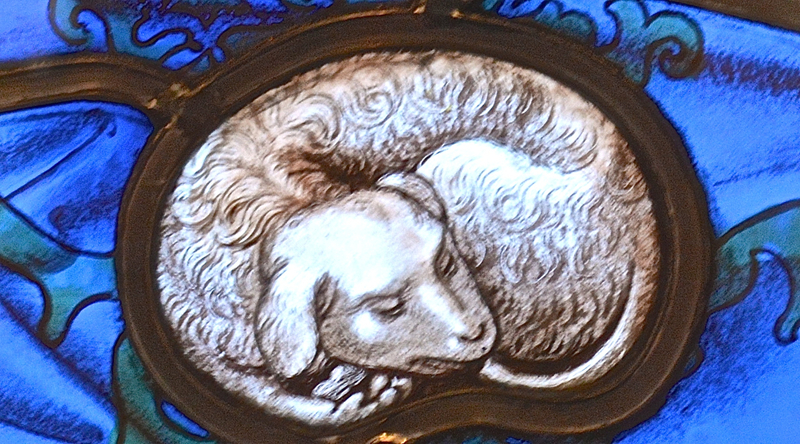 Okay, and what strikes me as interesting here is how the dog in the picture has some features that make it look similar to a sheep, which in the bible carries connotations of innocence and child-like demeanor — surely attributes we can ascribe to the best of our faithful friends. You’re right: I hadn’t even acknowledged that it looks like a sheep, but it does. Very meek.